Juergen Braehmer (49-3, 35 KOs) proved that he still has a lot left in the tank on Friday night in handing Rob “Bravo” Brant (22-1, 15 KOs) his first loss of his career in beating him by a 12 round unanimous decision in the quarterfinals of the World Boxing Super Series tournament at the Sport-und- Kongresshalle in Schwerin, Germany. 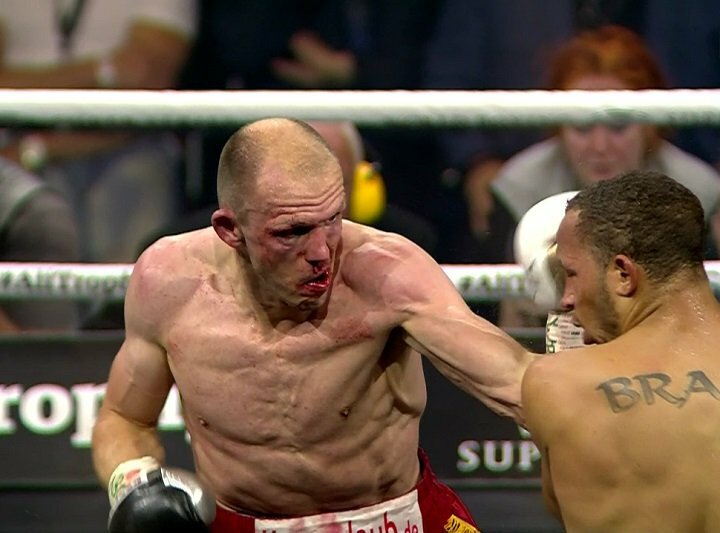 This was supposed to be a competitive fight going in, but it turned out to be a real one-sided contest with the 39-year-old Braehmer showing that he had too much talent and fire power for the younger, smaller, limited Brant in the WBSS tournament in Germany. The scores were 119-109, 118-110, and 116-112. Those were fair scores. Boxing247 had it 11 rounds to 1 in favor of Braehmer. It was impossible to give the 27-year-old Brant more than 1 one round in the fight, being that he was mostly on the receive end of the shots thrown in the fight. That’s not to say that Brant didn’t have his moments. Brant certainly landed some nice right hands here and there. Unfortunately, the times in which Brant landed anything of substance were few and far in between. Brant wasn’t landing often enough to win rounds, especially after the first 3 rounds. Braehmer settled in and took off with the fight. Once Braehmer figured out Brant’s style, it was target practice from that point on. From round 3, the fight was a one-sided mismatch with Braehmer connecting repeatedly with straight lefts to the head and nice jabs. Brant couldn’t get out of the way of Braehmer’s shots. The only positive thing I can say about Brant is the fact that he didn’t go down. Brant was knocked off balance many times from Braehmer’s hard shots. In round 9, Braehmer hurt Brant with a hard left to the body at the end of the round. Brant’s corner told the referee that he’d been hit low, but it was a legal shot. It was lucky for Brant that he was hurt at the end of the round and not at the start, because Braehmer would have surely finished him off quickly if he had more time to work on him. Braehmer suffered a bloody nose in round 5. His nose would bleed for the remainder of the fight, but it didn’t matter. Braehmer stayed calm and continued to take the fight to Brant as if nothing was wrong with his nose. Braehmer’s win over Brant will now send him into the semifinals of the World Boxing Super Series to face unbeaten Callum Smith. In his quarterfinals fight, Smith defeated Erik Skoglund by a 12 round unanimous decision last month on September 16. Smith didn’t look nearly as impressive beating Skoglund as Braehmer did tonight with his one-sided win over the 27-year-old Brant.